Logan Square is an up-and-coming neighborhood with vintage charm. It offers residents a more relaxed, quieter life than some of Chicago’s more crowded spots. However, all the popular attractions of the city are still easily accessible from this warm and friendly area. 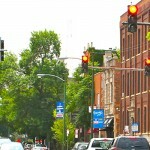 Logan Square offers an increasingly trendy urban vibe of funky shops, music venues, and multi-cultural restaurants. Its diverse mix of residents enjoys busy streets like Milwaukee, as well as quieter residential streets. Bicyclists in particular will find the neighborhood friendly to their two-wheeled transportation choice, and the neighborhood also contains parks for outdoor play. Logan Square is a very residential area – mostly made up of single-family homes, grey-stone and brownstone walk-ups and low-rise apartment buildings. Both renters and buyers will find opportunity here. Kedzie Avenue in particular is a neighborhood treasure: the beautiful tree-lined boulevard has many attractive and well-maintained vintage Chicago homes. The Logan Square neighborhood is served by the CTA’s blue line, which runs trains 24 hours a day to both O’Hare Airport and the downtown Loop. Busy bus routes such as the #56 (Milwaukee) and #74 (Fullerton) also run through this neighborhood, and open up the entire city to residents.